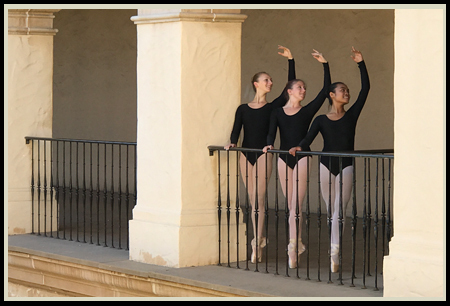 San Diego Civic Youth Ballet was founded in 1945 and has been the resident ballet school in Balboa Park ever since. In addition to offering high-quality, affordable, year-round training in the Casa del Prado studios, SDCYB produces three major productions at the Casa del Prado Theater each year: a full-length spring ballet, Fairy Tales in the Park each summer (which benefits the Scholarship Program) and the classic holiday production of The Nutcracker. There is also an annual Spring Showcase of the school and the SDCYB Performance Ensemble (which is comprised of the highest-level dancers) performs at special events throughout the community. SDCYB also brings ballet education to public schools and offers ballet classes for over 600 students through a thriving Outreach Program and offers affordable camps and intensives each summer that stress creativity, as well as technique. The summer programs allow students to study different dance styles, work with guest teachers from around the country and have an opportunity to create their own choreography. SDCYB has a “Ballerina Buddies” program as well which pairs younger dancers with older student mentors and offers special performances of productions for school groups and scout troops. SDCYB has also offered “Ballet for Me!” – a classical ballet class for children with unique physical needs - each spring semester since 2015. San Diego Civic Youth Ballet is a 501(c)(3) nonprofit organization. Copyright © 2013 San Diego Civic Youth Ballet. All rights reserved. Unless otherwise indicated, all materials on these pages are copyrighted by San Diego Civic Youth Ballet. No part of these pages, either text or image may be used for any purpose other than personal use. Photos courtesy of: Richard Benton, Kel Casey, Cathena Ferraro, Berwyn Hussman, Dan Kramer, Laurent Kramer, David Piearcy, and Marshall Williams. Website by Ahmad Hereford.